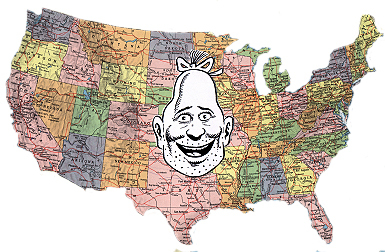 Zippy encounters a large cast of roadside characters in his ongoing cross-country road trip. From Long Island's "Big Duck" to the Giant Hand Car Wash on L.A.'s Ventura Blvd., Zippy has something meaningful to say to every outdoor icon he meets--and they're all happy to talk back!! Choose from the list of Zippy Roadside strips below, organized by State. Click on the city or town listed to see the strip. Who knows? Zippy may have already visited a Giant Being somewhere in your own neighborhood! ALL STRIPS ARE AVAILABLE AS EITHER BLACK-&-WHITE, SIGNED PRINTS ($55.00 each, includes shipping) OR AS HAND-COLORED, SIGNED PRINTS ($155.00 each, includes shipping). Specify TITLE and/or date of strip. All photographers whose photos are used receive a coveted "Tip O' Th' Pin" inside the printed strip!